This new product caught my eye because its so darn cool. 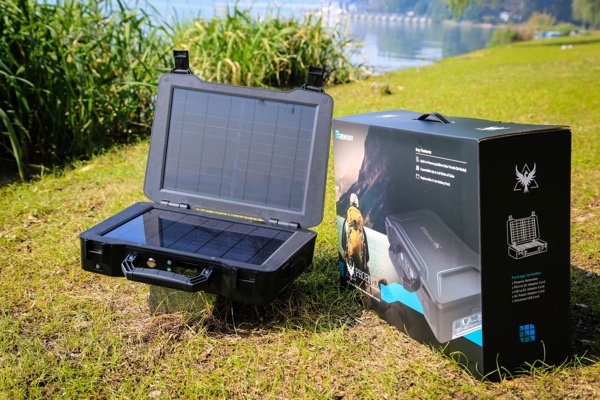 Consider: a replaceable Li-ion 16 amp-hour battery in a nifty suitcase (16 x 12 x 4 inches), 13 lbs, with 2 x 10 watt solar panels built into the lid that can charge it in about six hours. Outputs include 110 volts AC, 2 x 12 volts DC and 4 x USB (6 amps). You can also charge it from your car or AC power. The battery packs enough energy to charge an iPad Air six times, an iPhone 32 times or a small notebook five times (40 W-h). Perfect for the camper, and it’s now available, under $600.00.